I got a little discouraged after downloading the new iPhone update 10.0.1. When I get a notion to blog and all I have is my phone with me, I would use the free "Blogger " app. Well... The blogger app no longer worked as it would kick me offf with in minutes of using it. I became frustrated. So I did some research and even tried to delete the app and add it again. Couldn't. Notta. So I was forced to purchase the "Blog Touch Pro" app for 4.99. First app ive ever purchased but its that important to me. Apple Probably knew This. But hey, I think I like it It's easy to change font and color. I can even make the words big when I want to shout. This is really just a test post so I can get familar with it. 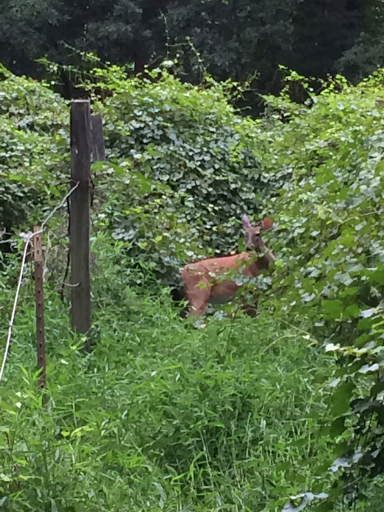 Ok so here is a test photo while im at it..
Its deer we saw the other week on our walk. With just a touch I was able to make the photo smaller or larger than original. I think imma gonna like this app. Now yall gonna have to send me comments so I can see how those work too. All you "Blogspot" Bloggers. Good luck!!!! Post looked just fine. Nice picture of the deer. I can't believe you post from your phone - your eyes must be wayyyyyy younger than mine, lady!! Sometimes I do. My post are oftern spur of the moment. I use my IPad usually and the old app didnt work there either. It looked great. My eyes (and fingers) wouldn't allow me to post from a phone either. Hey! Nothing wrong with that. We are all new to the technology at my house. I like it. I will try to look it up. I had a program a year ago but it no longer works. I gotta mind this one. Yeah it does look good. I had to edit the name of the app. Its called "Blog Touch Pro". Hi Lisa, I just downloaded this blog touch pro app to upload photos and blog posts from my phone and ipad. I have question for you. Can you explain how and what steps I need to do to write a post in draft form? Thanks I would really appreciate you help.